So you’ve got a college-bound student? Congratulations! Here are some college application resources to help you get him or her into the right college. We’ve sifted through some of the vast amount of information out there to find the materials that are most useful to you. Want more college info right to your inbox? We publish our college counseling newsletter almost every month. In every issue, you’ll learn what your student needs to do this month based on his or her grade. You’ll find out about the latest updates in admission for both California colleges and colleges outside of California. We’ll even let you know what deadlines and college admissions events are coming up, and what you need to do about it. See previous editions of our newsletter here. Follow our Facebook and Twitter pages for lots of tidbits and links! We’ll let you know there when something new is posted to our site. People are unique and college lists are too! When you put in the time to research each college, you may find a few that really feel like a good match. These college search resources can help you determine which colleges are a good fit for you. 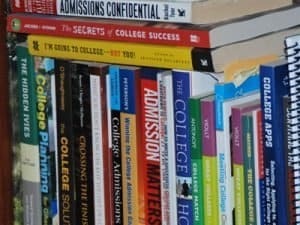 Collegedata.com – The best feature about this site is that you can determine whether a college gives MERIT-based aid (which many colleges do not) in addition to NEED-based aid (which most colleges do). This site will also help you learn how much of your need each college will fill. Some do not fill 100% of your demonstrated need. GoSeeCampus will help you plan your college visits online. We’ve put together an excellent college counseling resource guide with some helpful information about the entire college search and application process. We’ve also put together some good information about applying to the colleges in the University of California system. And, if you’re interested in attending a private college, we’ve got you covered there, too. For parents, there’s this list of 10 things parents should know before your son or daughter applies to college. It’s a quick read and well worth your time. We’ve got some terrific Free SAT and ACT prep resources for you.